In this article we look at how you can keep your leather looking like new with Autoglyms Leather Cleaner and Leather Care Balm. One of the most overlooked areas when cleaning a car are your leather seats. They usually receive a quick vacuum, maybe a wipe down with a damp cloth and then their left to fend for themselves. You protect the cars paint and trims but what about the leather? Autoglym Leather Cleaner should form part of your regular internal clean and can really make a difference in keeping your leather seats looking and feeling like new. Leather is subjected to multiple damaging effects especially in the summer months. This including the suns UV attacking the colour pigment, course sand from the beach acting as an abrasive. Salt from either the sea water or from sweat can stain and visually tarnish the surface, zincs from sun cream can embed themselves and lighten black leather, kids spilt slushies creating sticking residues as well as the normal dirt grounded in off your clothes. Dirty leather can present itself in the form of shiny patches, blotchy or dulled colour seats depending on the contaminants that have been left on there. Getting a uniformed appearance that looks like the day you purchased the car is the key. 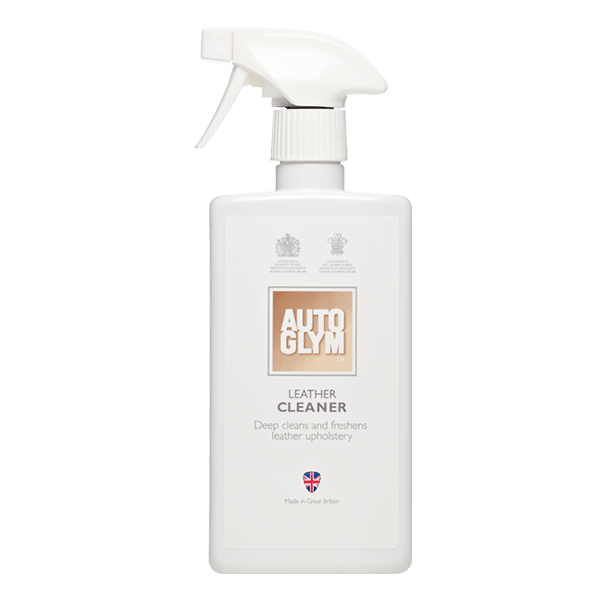 Autoglym Leather Cleaner is a soft cleaning foam that is safe on any leather or faux leather surface. The PH Neutral formula won’t react to any surface or protective coatings that may have been applied to the seats previously. Autoglym Leather Cleaner is also Silicone Free so will leave a natural matt finish and non-greasy texture when dry. 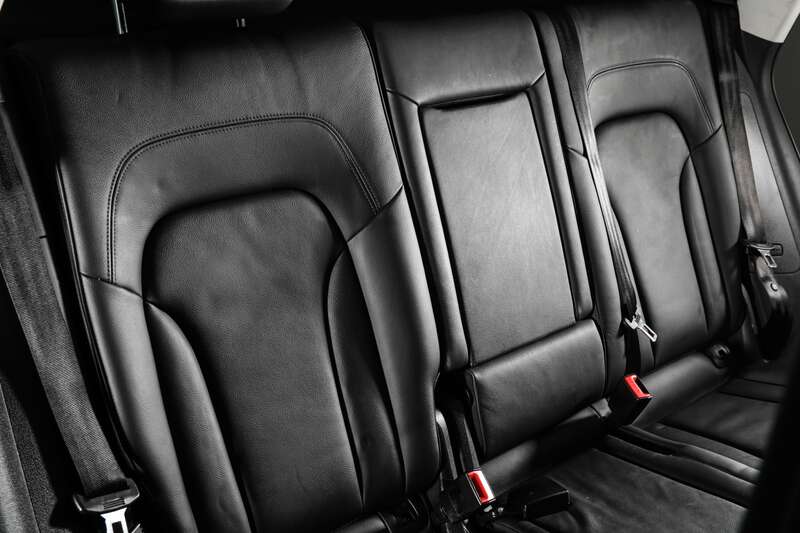 Always vacuum the leather seats to remove lose dirt and sand. The main thing to consider here is using a soft bristled brush attachment as leather can scratch, especially if it’s old and dry. Lose dirt always finds the low points of the seats and embeds into the stitching. Gently push down on these areas to expose the stitching, allowing the vacuum to get access. 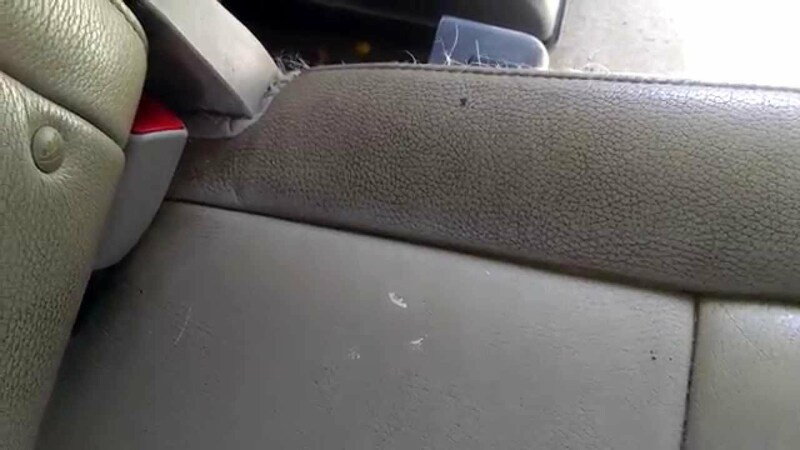 If the seat is full leather then squirting Leather Cleaner directly onto the seat is fine. 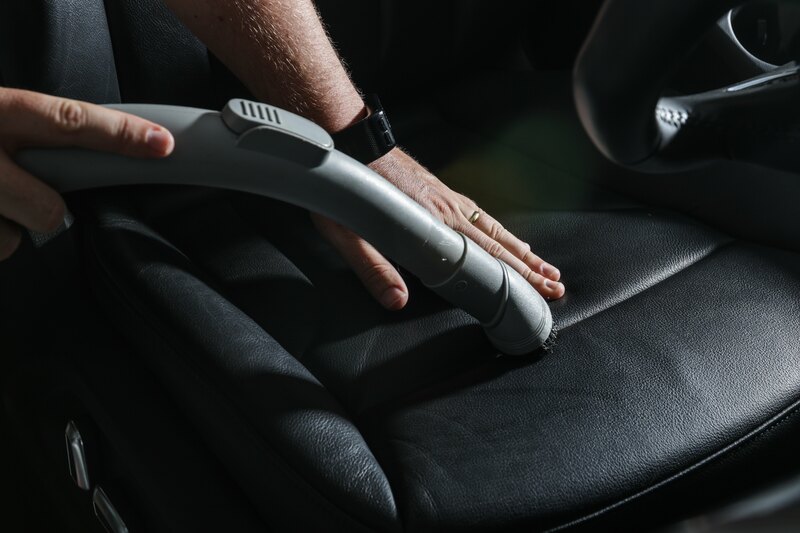 If your seat is leather trimmed, meaning the edges are leather with a fabric seat and back support, then squirt the Leather Cleaner onto the microfibre cloth and apply in a more controlled manor. As we want to gently clean with a foam we often use a clean sponge or a microfibre cloth, as this will get into the structure of the seat while providing enough pressure for the foam to work on the surface. Once the seat has been lathered up then wipe down with a clean chamois to remove the foam. Rinse the chamois out and finish by wiping the seat once more to remove any trace of Autoglym Leather Cleaner from the seat. Left seat has been cleaned showing the shiny dirt and grease removed. Once the seat has dried you will be left with a clean natural matt finish. However, as leather is a natural product you need to ensure you hydrate and protect it to stop it cracking and fading over time. 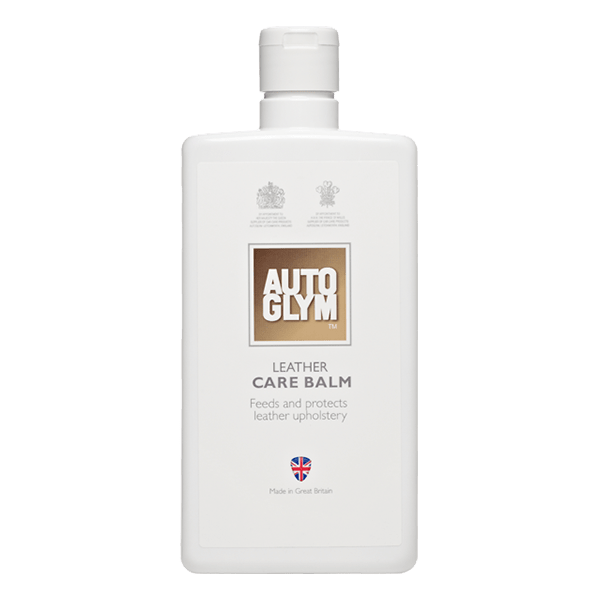 Autoglyms Leather Care Balm is the perfect way to hydrate and protect your leather. 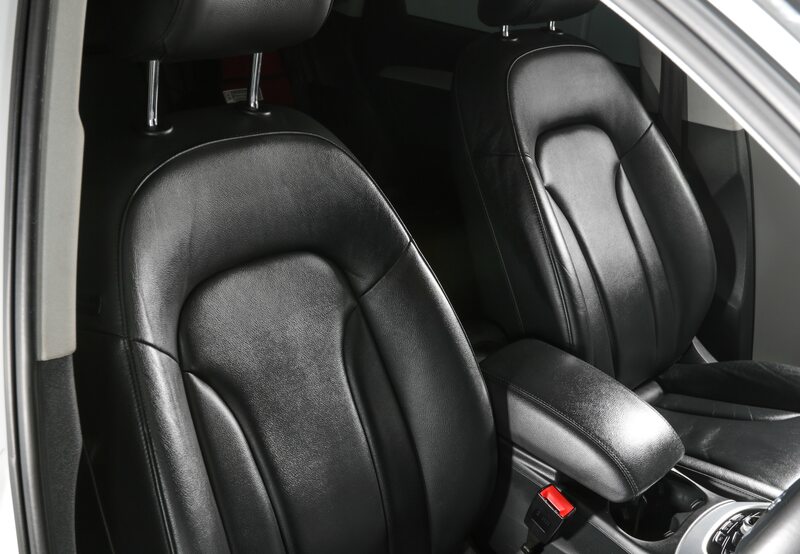 Dry leather is more prone to cracking on high pressure or wear areas such as the side lumber supports and seat edges. Dry leather is also more likely to stain or retain a contamination for longer as any foreign liquid will likely be absorbed deeper. Leather Care Balm contains a carefully blended pH neutral emulsion containing soaps, natural oils and surface proofing agents which nourish and moisturize vehicle leather safely and quickly. The older the leather the more Balm you may need to apply, where new leather will need less. When applying Autoglym Leather Care Balm always ensure the seat has been cleaned with Leather Cleaner first. This ensures foreign contaminants are not sealed in when applying the balm. Shake the bottle well and pour Leather Care Balm onto a polish applicator or soft cloth. Test on a small inconspicuous area first to check for colour fastness. This is just a precaution. Once satisfied pour a good amount of balm onto the applicator or cloth and gently massage into the surface of the leather to ensure full coverage. Dry leather will soak up the balm quickly where new leather will allow it to be spread easier. Allow a few minutes for the balm to fully absorb and then buff the seat with a clean microfibre cloth. This will remove any balm left and give the leather a natural matt finish. IMAGE Shows the seat on the left protected with Leather Care Balm with the seat on the right just cleaned. Autoglym Leather Care Balm will moistures and help protect your seats from drying, cracking and staining. Depending on the age and condition of the seats will depend on how often you need to re-treat. If you have any questions on our Leather Clean and Protect process contact us today or jump onto Autoglym Australia Facebook page. Copyright © 2015 Autoglym, all rights reserved. Autoglym is a trading division of Altro Ltd.